It's almost here folks! Only four more sleeps to the Butter Chicken Cook-Off. Sunday, March 4th at 2:00 PM at Jimmy's Taphouse in Vancouver (783 Homer St at Robson) 3 chefs will go head-to-head to determine who really does make the best Butter Chicken. 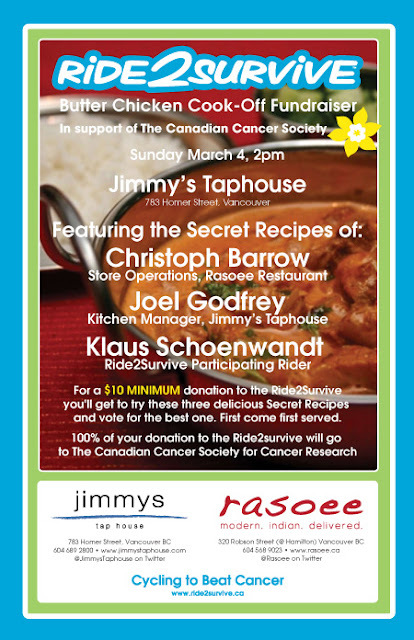 Tasting and voting is by minimum $10 donation to the Ride2Survive benefiting the Canadian Cancer Society. 100% of your donation to the Ride2survive will go to The Canadian Cancer Society for Cancer Research.